This was a team that had not won anything at all in any format on its two winter tours and was beaten by Sri Lanka and Pakistan in the Asia Cup. They had come close, of course, they had competed, but that winning feeling had last come for them against West Indies at home in November last year. Yes, Bangladesh is much closer to home for the Indians compared to South Africa and New Zealand - home is just a "forty-minute flight away" as MS Dhoni said - but a winless environment is not what you want to take with yourself into a world tournament. Yes, the conditions played a big part, but India have to be lauded for putting in such a commanding performance all the way to the final that somewhere along the way, they became title favourites. This after entering the tournament with only two wins - against Bangladesh and Afghanistan - in nearly four months. And with a World T20 record in the past three editions that suggested the format began and ended for them with the IPL - they are not allowed to play in any other domestic T20 league, and they couldn't perform in the World T20. This time, not only did India win consistently in Dhaka, they won every game convincingly till the final, so convincingly that the victories started to look formulaic. Bowl first, bowl aggressive wicket-taking spin, restrict the opposition, and hunt down the modest target with ease. This approach worked to perfection in their first three games against Pakistan, West Indies and Bangladesh, and made them the first team in the tournament to qualify for the semi-finals. They wanted to bat first in their final group game against Australia, were put in and recovered to post a decent total before the spinners, led by R Ashwin, demolished the opposition. The batsmen, led by Player-of-the-Tournament Virat Kohli, took over in the semi-final against South Africa, hunting down 170-plus against the might of Dale Steyn and co with nearly an over to spare. India made this match appear like a typical subcontinent ODI chase, where their batsmen were capable and confident enough to surge past whatever their bowlers had conceded. India can take credit for showing in this World T20 that it is possible to play formulaic cricket in the shortest format in familiar conditions and develop a measure of consistency in winning, something thought to be nearly impossible in T20. Almost all their wins were one-sided. Their matches lacked the kind of chaotic thrill a crowd expects from a T20. This lack tells you a lot about their dominance in a format which, due to its ultra-condensed nature, produces nail-biters almost by rote. It seemed too good to be true, and things came unstuck spectacularly in the final, where the mighty line-up was hamstrung by its most experienced member and by a charged-up, disciplined opposition attack. The signs had not been encouraging from Yuvraj Singh in the first couple of games, where he fell short in whatever he tried to do on the field. When he came good in a no-pressure game - from the team point of view - against Australia, it seemed India had ticked the one final box on their sheet going into the knockouts. It was to prove misleading. Yuvraj's struggles were back in the semi-final, and peaked in the final, where he had one of his worst off days ever, simultaneously draining whatever momentum Kohli was providing at the other end. That said, it is a reflection of the unbelievably extreme pressure under which Indian cricketers play, when reports come in that Yuvraj's house was stoned after the final. Not only was it utterly disrespectful to the man who had won India the 2011 World Cup, it was also unmindful of the fact that it was the last hurdle at which the team had fallen, and not in the qualifying rounds. And before the final, they had won five successive matches, something they did not manage even when they took the title in 2007. The man who had fallen one match short of becoming the first captain to hold the World Cup, the Champions Trophy and the World T20 at the same time, was satisfied with how India had performed in Bangladesh. "Overall if you see the whole tournament we played really well," Dhoni said after the final. "Right from the practice matches, and it was (also) evident from the fact that we didn't have too many changes in our side as the tournament progressed. Spinners contributed when there was a bit of turn for them. Throughout the tournament, more often than not, they bowled well. 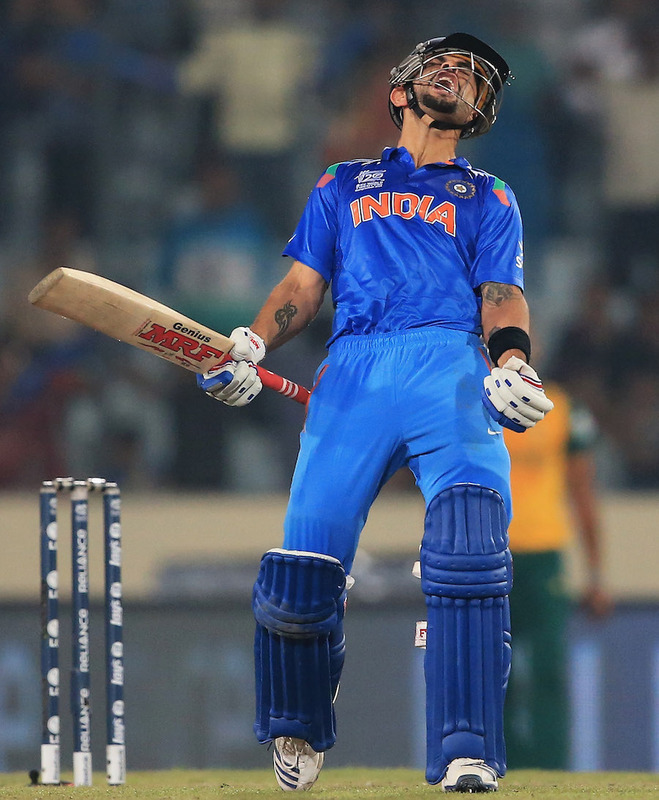 And Virat has been brilliant for us for last one, one and a half years, even more. He is someone who has been very consistent. Yes, overall very happy with how everybody performed." That is the conclusion Indian cricket's well-wishers should take from this World T20. Bangladesh 2014 emphatically ended the disappointment of England 2009, West Indies 2010 and Sri Lanka 2012. The abiding image should be one of Kohli mastering the chase in the semi-final, although the chance is it will be that of Yuvraj bottling up in the final.